The year is 1979. The Iranian Revolution is just around the corner. In the northeastern city of Naishapur, a retired judge and his wife, Bibi-Khanoom, continue to run their ancient family orchard, growing apples, plums, peaches, and sour cherries. The days here are marked by long, elaborate lunches on the terrace where the judge and his wife mediate disputes between aunts, uncles, nieces, and nephews that foreshadow the looming national crisis to come. Will the monarchy survive the revolutionary tide gathering across the country? Will the judge's brother, a powerful cleric, take political control of the town or remain only a religious leader? And yet, life goes on. Bibi-Khanoom's grandniece secretly falls in love with the judge's grandnephew and dreams of a career on the stage. His other grandnephew withers away on opium dreams. A widowed father longs for a life in Europe. A strained marriage slowly unravels. The orchard trees bloom and fruit as the streets in the capital grow violent. And a once-in-a-lifetime solar eclipse, set to occur on one of the holiest days of year, finally causes the family--and the country--to break. Told through a host of unforgettable characters, ranging from servants and young children to intimate friends, To Keep the Sun Alive reveals the personal behind the political, reminding us of the human lives that animate historical events. RABEAH GHAFFARI was born in Iran and lives in New York City. She is a writer and filmmaker whose fiction was included in Reflections on Islamic Art and whose documentary, The Troupe, featured Tony Kushner. Her most recent feature-length screenplay, The Inheritors, was commissioned by producer and costume designer Patricia Field. 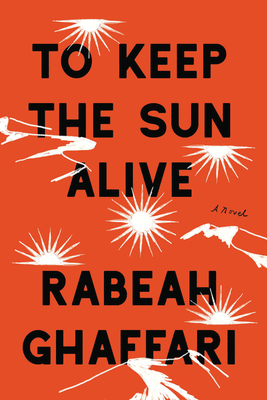 To Keep the Sun Alive is her first novel.